Trends counters decline in auto fatalities. 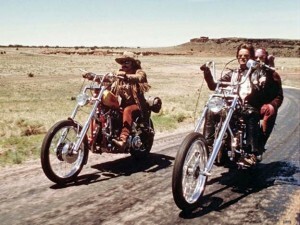 Easy Riders. More and more states are lifting motorcycle helmet laws -- to tragic results. “We call it the organ donor enhancement act,” said Dr. Bob, a physician at a large suburban Detroit hospital. “We’ve always had a shortage of donors but expect to see the numbers go way up,” said the emergency room veteran asking not to be quoted by his full name speaking so callously. But it appears he was right to fear the impact of the recent decision by Michigan lawmakers to repeal the state’s mandatory helmet law. A new report by the independent investigative website FairWarning.org finds that the trend towards giving riders the freedom to go helmet-less is resulting in a significant increase in motorcycle fatalities. That’s precisely the opposite direction from the overall highway death trend. Despite the surge in motorcycle fatalities, overall traffic deaths last year fell to their lowest level since 1949 and on a deaths-per-100-million-miles-driven basis the figure was the lowest since records started being kept in the 1920s. Put another way, noted FairWarning, in 1997, total motorcycle fatalities came to 2,116, one of every 20 U.S. traffic death. By 2010 that surged to one in seven, with total motorcycle fatalities increasing to 4,502. The potential to save lives has led virtually every state in the union not only to pass mandatory seatbelt laws but, in a growing number, to increase enforcement efforts. That includes Michigan which is in the midst of a “Click-it-or-Ticket” campaign. Yet, earlier the Midwest state became the latest to repeal its mandatory helmet law, instead requiring that bikers who want to feel the wind in the air to increase their medical insurance coverage and meet one of several additional requirements. In the 1970s, notes FairWarning, 47 states required motorcyclists to wear helmets. With the move in Michigan that is down to just 19 – though a number of other states still require helmets for the very youngest riders and passengers. Author Rick Schmitt notes that in a long-running and well-organized campaign backers of repeal have carefully built their case even while gagging opponents. That includes the National Highway Traffic Safety Administration which was hit by a 1998 rule that now blocks it from advocating safety measures at the state and local level. Biker lobbyists also “derailed a measure (federal) lawmakers envisioned to reinstate financial penalties for states lacking helmet laws,” noted Schmitt. Advocates of helmet law repeal have been urging the federal government to shift money from enforcement to biker training. Yet a 2007 Indiana study found that drivers who completed a basic course were actually 44% more likely to be involved in an accident than those who didn’t get training – perhaps because they felt encouraged to take more risks. “You cannot be in this battle and not be frustrated by this senselessness,” Michael Dabbs, president of the Brain Injury Association of Michigan, told FairWarning. They point to facts that show helmeted riders in moderate to severe crashes often walk away while those not wearing helmets often suffer severe head trauma – or death in otherwise insignificant incidents. According to data NHTSA itself is now barred from presenting at the state and local level helmets saved 1,483 lives in 2009 and would have saved another 732 had everyone been wearing them. The counter-cry is “freedom,” advocacy groups contending that bikers should have the freedom to choose. Backed by significant amounts of cash and the restrictions on federal regulators the anti-helmet lobby has continued gaining momentum and is stepping up its campaigns in those few states, like New York, that continue to mandate helmets. This entry was posted on Thursday, June 7th, 2012 at and is filed under Automobiles. You can follow any responses to this entry through the RSS 2.0 feed. Both comments and pings are currently closed. Oh … what a surprise! The arguments put forth by the supporters of the no-helmet law are fatuous in the extreme and it comes as no surprise to anyone with half an ounce of sense that wearing no helmets is crazy. America is the only country in the world where it’s cool to act stupid. As I mentioned in a Facebook post, I rode motorcycles for many years (though haven’t in a while) and had an incident that made me realize the value of a helmet. Yes, I tried riding a few times without one when I was briefly living in Chicago in 1977. Luckily, a while later I had my classic Bell on when a car forced me off the road. I flipped over the handlebars and when I finally realized what happened discovered a nice stripe of tarmac on it, looking a bit like an asphalt racing stripe. I was only scraped up but because of the way I hit and what happened to the helmet my doctor told me I clearly would’ve had a closed-head injury, if not worse. I find it quite funny watching bikers on Michigan roads since the helmet law was repealed: it’s common to see the guy up front with no helmet, his lady in back wearing one. It would be interesting to track crash data to see what will happen in such situations. My sense is that there’ll be a lot of widows walking away from crashes. We would save more lives if we required all auto drivers to wear helmets! Are you willing to wear one in your car? Paul A. Eisenstein, free choice might work when it comes to assisted suicide, but driving a car without a helmet — never mind the potential impact on family and friends — is a needless choice that also burdens society. The more people who wear helmets in cars, the few deaths! Do we need any more arguments for mandatory car helmets? LOL…Will, I am cautiously assuming that your comment is a contrivance, a back-handed anti-helmet jab. The fact is that were we not to have extensive alternative safety provisions in vehicles, such as safety belts, extensive padding and the rapidly expanding use of airbags, I am sure there would be some who might argue in favor of helmets IN cars. Certainly, on most press events involving track time we’re still required to wear them due to the unusual risks such driving requires. I’ve not seen ANY data suggesting helmets would today do much in a vehicle operated on a public roadway to reduce the already plunging auto death rate. But the data clearly show that the anti-helmet experiment has led to a rapid and substantial increase in fatalities and serious injuries on motorcycles. To flip the argument, would you argue that society’s interests are minimal enough in contrast to the “freedom” to skip seat belts and to not have to pay for safety technology so that we repeal the associated laws? True, we’ve reduce highway deaths by something like 15,000 annually and the trend continues to plunge as more and more advanced safety gear works through the national fleet. But the call for “freedom” of choice suggests that THIS would be a straw man argument, that the number of lives saved is irrelevant and that society simply shouldn’t be intruding in the choice to purchase a strippo car that might fold up in a head-to-head collision with a dog if a driver so wants. Ever heard of “free choice?” If ever there was a victimless crime it is riding without a helmet. The rider makes the choice – and bears the consequences. There are multiple examples daily of people deciding to do things that are dangerous, but they choose the tradeoff – smoking, drinking alcohol, taking steroidals, jumping off high diving boards, water skiing, playing football – the list is endless. You don’t need to moralize to someone when they make these choices, just point them out – and then move on. Riders without helmets are taking a risk, one they choose to make, because they enjoy riding helmetless. It’s their risk, not yours, and it would be good if you left them alone. I hear this argument but it doesn’t fly. Free choice might work when it comes to assisted suicide. But riding without a helmet — never mind the potential impact on family and friends — is a needless choice that also burdens society. One only has to visit the nearest rehab facility and ask what percentage of people they treat were injured in motorcycle accidents, and particularly those who are recovering from closed head and other head-related injuries. The death and serious injury toll resulting from failure to use helmets is a burden on police and rescue squads, a massive burden on hospital emergency rooms, and a major burden on rehab and related facilities. It also means I am a victim as all the data suggest that such accidents add costs to insurance, taxes, etc. As one comment on Facebook to my post rightly pointed out, the added $20,000 in medical coverage required by Michigan won’t begin to cover a typical closed head injury case. All the data show that not only are deaths and serious injuries going up but so are costs to taxpayers and motorists paying insurance. This same nonsense argument has, happily, only worked in one state, Massachusetts, to get voters or lawmakers to repeal seatbelt laws. We readily see the payoff of wearing seatbelts — as usage rates start approaching the 80-90% level in most of the country the traffic carnage plunges. Ironically, the use of seatbelts and other safety tech has provided a good argument for raising speed limits which has apparently not had the adverse impact opponents had feared. I am all in favor of eliminating unnecessary rules. But regs that can save 100s, even 1000s of lives a year — and reduce the burden on me and fellow tax and insurance payers — that’s a different story. I tried riding without a helmet many years back and was lucky that I didn’t feel comfortable so started wearing it again. I still have the Bell that shows a large “racing” stripe of asphalt from when I was driven off the road, flipped over the handlebars and scraped the pavement hard. I had otherwise minor injuries but still went to the docs. There is little doubt I would’ve had a closed head injury. Sorry, Adam, the arguments for no helmet laws are specious. And the data we quoted in our story is only further proof.